Do you get stuck at the beginning of each month when trying to create new page spreads? Do you go with the same layout every month or do you make your pages reflect the season? In this blog post, I’ve found some inspiring spreads to help you kick off October. Break out your markers, colored pencils, and washi tape to create some fun fall pages! If you like doodling in your bullet journal, you might also like this post, Easy Fall Bullet Journal Doodles. Make an October cover page by writing the month in the center of the page. Write it in calligraphy or use your favorite hand lettering. Then surround it with a leaf wreath. Add some falling leaves scattered on the page. You could be done or you could pull out the orange, yellow, red, and brown colored pencils and make it really pop. This pretty page was created by Calligraphyell. Create a monthly layout over two pages. Leave approximately half the page on the right to log important goals and events. Add a few pumpkins, falling leaves, and lots of color! Page by tina.stepanova, very inspiring! Pull out your watercolors to create a page like Veni.vidi.vivid. Make a welcoming pumpkin and vine October welcome page and add the month name in calligraphy. On the opposite page, create a monthly spread, add a few more watercolor pumpkins, and edge it with washi tape. colourmaniac created a monthly page spread inspired by her favorite game. Did you guess what it is? Click here for a clue! Most of our October inspiration includes traditional fall and Halloween ideas, but I love this one because it provides a really fun and unique idea. Do you have a favorite game that you could use to inspire your bullet journal layout? Let me know what it is in the comments below. This month, why not make a square wreath? It’s easier than you think! Cut a square the size you want the wreath (or better yet, use a 4” x 4” square Post It), and place it on the page. Then draw your wreath around it. Don’t worry if you get marks on the Post It, that’s why it’s there. When you are done drawing, remove the Post It, and color in the wreath. I love this square wreath inspiration from studyngrn. Your bullet journal doesn’t have to be a place to record upcoming events. You can also use it as a spot to log memories! 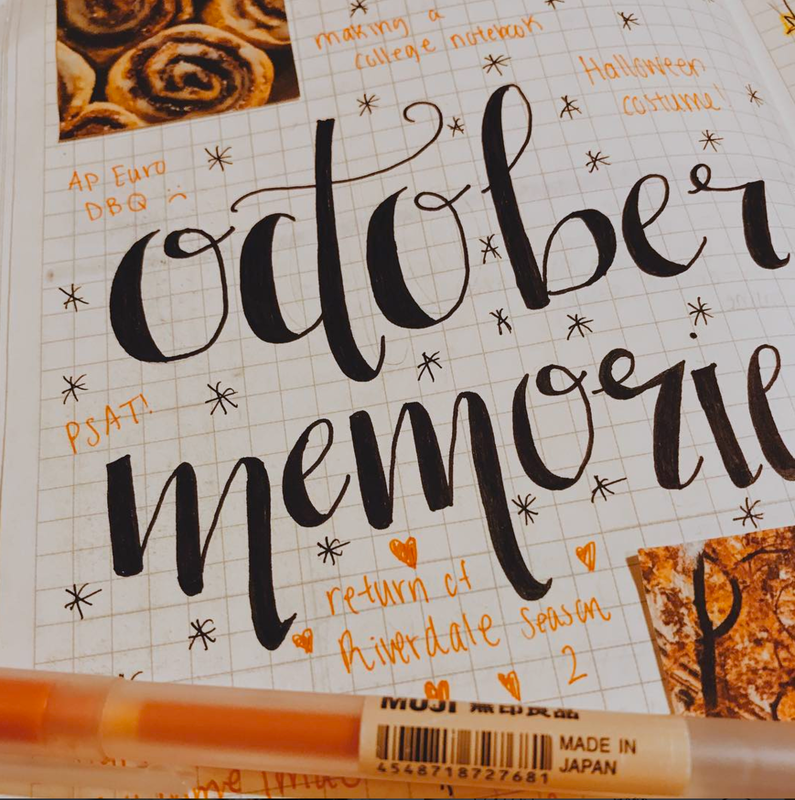 2chenstudies created an October Memories page in her bullet journal and you can too. In calligraphy, write “October Memories” on the center of the page. As the month progresses, keep track of fun things that happened by logging them on this page. You’ll love looking back on these pages for years to come! Page by the.bubbly.planner is full of fall favorites: pumpkins, falling leaves, and spider webs. I love the way the writing curves around the pumpkins! Make a simple and really cute October weekly spread. Add rounded boxes for each day of the week and then add a shadow to each box. Decorate the page with some easy leaf doodles and color in. Be sure to add a space for goals and upcoming events for next week. This adorable page by Bujo_belle is a must-try for fall! Not all mood mandalas have to be perfect circles. I’m completely inspired by this page from Bujo.huntress. She made a spider web by placing a dot on the center of the page and then drawing lines outward. She then made 31 slightly curved lines around to create an awesome mood tracker. Use Halloween inspired markers to track your mood all month! You don’t have to be into doodling to create a haunted Halloween page. Just use stickers. This page by Planwithmyka uses lots of howling good stickers from this Happy Planner Sticker Pack. This spread is simple and easy to replicate! Created by bujolove778, all of the elements were created in black and orange. Then the areas around the boxes were colored in with an orange marker. It’s a fun, yet really easy way to create a festive look. Make your calendar page work for you by color coding the dates. This page from themarkupartist_ has a calligraphy header adorned with fall leaves. Date boxes and leaves are colored in with autumn inspired markers. How will you layout your bullet journal pages for October? Let me know in the comments below!